The Gulf is an environmental treasure and central to the nation’s economy. America needs the Gulf. America needs the Gulf to be clean. America needs the Gulf to be healthy. America needs the Gulf to be sustainable. On April 20th 2010, Deepwater Horizon, a Swiss-owned and BP-operated oil rig, blew up only 65km from the Louisiana coast, causing one of the worst environmental accidents in US history. 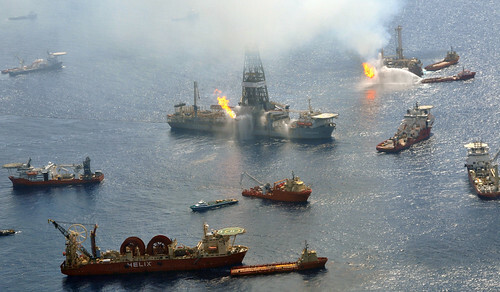 Eleven workers were killed in the accident and millions of liters of oil spilled into the ocean. Two days after the accident, the whole platform sank. Oil continued spilling into the ocean for months after. 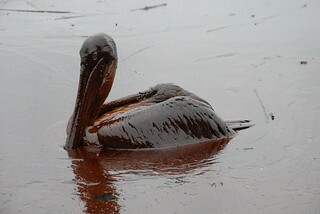 The accidental spill resulted in massive damage to coastal and marine species, particularly to turtles and dolphins but also to birds, other reptiles, mammals and flora. Massive mortality was observed in communities such as snails, mussels and rhizomes five months after the initial oil-marshes contact. Deep-sea coral communities were also severely impacted. More than 900km of coast was seriously affected environmentally, economically and socially and many people living from the oyster industry in Louisiana were forced to look for alternative employment after oyster companies shut down. Hydrocarbon diluted into water and formed a large plume of which only a small portion could be detected visibly. In fact, according to an investigation led by a team of scientists from US and EU scientific and academic institutions, subsurface plumes were preferentially enriched with water-soluble components (benzene, toluene, ethylbenzene and total xylenes), indicating that aqueous dissolution played a major role in the plume formation. Almost two years after the accident, scientists still found sick dolphins and deep-water corals within the spill zone due to the exposure to polluted water. Dolphins showed abnormally low levels of certain hormones that help with stress response, metabolism and immune function. Tested dolphins also suffered from low body weight, anemia, low blood sugar and symptoms of liver and lung disease. A dark mucus film covered wide portions of studied coral colonies. Longer term effects are more related to “invisible” threats released both into the water and the atmosphere. Water-soluble oil components diluted into the water are probably causing diseases in corals, dauphins and turtles, among other species. Air quality was affected not only by direct emissions from the spill and related operations but also by the reaction products in the atmosphere such as ozone and secondary organic soot (SOA). However, these aerosol products had a limited impact on populated areas. Effects on flora, fauna and humans are difficult to predict in the longer term. Cancers, abnormal breathing, metabolic and hormonal changes, reproductive impairment and genomic modifications in general are potential major long term health consequences. These consequences are difficult to measure and also to correlate directly to the accident; however numerous studies have shown that “invisible” particles are still present. Some studies have shown how the long-term impacts of large-scale oil spills affect certain mammals, indicating that the effects can be rigorously analyzed by using a combination of population data, modeling techniques and statistical analyses. Therefore, long-term effects analysis is still expected for the Deepwater Horizon (DWH) oil spill disaster. Restoration efforts have been addressed at three different levels. At the federal tier, Secretary of the Navy and former Mississippi Governor Ray Mabus released the first integral long-term recommendations report in order to advise President Obama on the decisions to be taken to address short and long term spill recovery and restoration actions. The American government took the recommendations very seriously and started a mega-trial against BP and the companies owning and operating the DWH rig. The timeline of federal actions has been as follows: On April 21st 2011, Deepwater Horizon Natural Resources Damages Trustee (DNRDT) announced $1 billion to fund early restoration projects, a down payment on BP’s total liability ($20 billion). Seven days later, DNRDT announced eight early restoration projects ready for implementation; on the same day, the US government announced a$7.8 billion settlement with individual and business plaintiffs to resolve economic loss and medical claims from the accidental spill. In June-July 2012, Congress passed the RESTORE Act as part of Surface Transportation Bill. RESTORE establishes that 80% of all administrative and civil penalties related to the spill go to a Gulf Coast Restoration Trust Fund and includes a structure and rough distribution for the use of the funds. After President Obama signed it into law, the US announced a $4.5 billion criminal settlement with BP including 2.4 billion for the Gulf of Mexico and bordering states harmed by the oil spill. In January of this year, the US government announced a further $1 billion settlement with Transocean Deepwater Inc. and related entities under the Clean Water Act. Beyond these legal and legislative steps, in terms of implementation, the Gulf Coast Ecosystem Restoration Council (GCERC) has prepared a Proposed Comprehensive Plan which aims to ensure the long-term health, prosperity and resilience of the Gulf Coast. Consistent with the RESTORE Act, its goal is to restore the economic dynamism of the region while protecting the environment. However, although major damages have already been addressed, longer-term restoration programs have not yet been started, as is evident on the GCERC web site. State tier efforts have resulted in an unprecedented state-federal collaborative process. Trustees acting on behalf of the general public were recognized after the Exxon Valdez oil spill in 1989 under the Oil Pollution Act (OPA). The Trustees manage funds deployed to the restoration efforts by BP and other sources. The Deep Water Horizon Trustees began working together in the early days of the spill and ten restoration projects have been funded to date in two different phases (fig. 1 and 2), including oyster cultch projects in Louisiana and Mississippi, dune restoration projects in Alabama and Florida, a marsh restoration project, and habitat improvement projects in Florida, Alabama and Mississippi. At the local level, the inherent resilience of local communities has allowed a quick recovery from the spill’s effects beyond the massive external assistance brought in by the government, NGOs and volunteers from all over the country. Inherent resilience is a set of practices that natural resource-dependent residents deploy to cope with disruptions and that are retained in their collective memory. It looks like the massive external contribution has shortened the natural inherent resilience process, seeing as no further longer-term actions seem to have been taken locally after the accident. The local community has been and is participating in the formal reconstruction plans handled by state and governmental agencies and institutions, hoping this inherent resilience will be streamed into the general and formal action planning. Otherwise, it looks like inherent resilience will be lost to the detriment of external and larger scale decision-making. Hydrocarbon production will see a surge in the Gulf of Mexico. What comes next? In spite of the recent large-scale Deepwater Horizon oil spill accident, which is the largest in the US history although not the only and most probably not the last, Washington has continued to issue new exploration and extraction licenses in the Gulf of Mexico. According to the media, Gulf of Mexico oil and gas extraction companies will increase production by 28% by 2022. Several projects are currently underway, with Exxon Mobile, Chevron, Shell, Petrobras, Anadarko and Hess as some of the most active players in the area. Other smaller exploration companies (Houston Energy LP for example) have also chosen the Gulf of Mexico to expand their businesses instead of going to other areas such as the North Sea. This is the case for most shallow-water operations in which small players dominate. Shallow oil and gas exploration projects have mushroomed in the Gulf recently, as high dollar outcomes are expected from oil high prices. Furthermore, although there are plenty of associations, institutions, agencies and NGOs receiving funds from BP liabilities through the Trustee Fund, this reporter was unable to find a centralized funds monitoring site from which anyone could follow up on BP fund allocation in the long term. Nor were funding details encountered for the long-term restoration plans forecasted by the Gulf Coast Ecosystem Restoration Council. Although on July 12 2011, the GCERC published a detailed oil spill cost and reimbursement fact sheet, which included 11 paid and 1 unpaid bills to BP, this represents $716.59 million only – which corresponds to the initial emergency clean-up response alone. What happened to poor people affected by the oil spill is still unknown. How many of them lost their jobs? Have they got their jobs back almost three years after the accident? What has happened to small businesses? How will the spill affect the long term health of coastal inhabitants? Who is monitoring the allocation of the funds and which are the criteria followed? These are questions which are not addressed by any agency or media group and which will most probably be buried over time.